The Law Court Building forms the focal building at the entrance to the University’s deHavilland Campus. Designed to encourage pedagogic innovation the building accommodates a range of teaching spaces of varying group sizes and is arranged around a contemporary and IT rich Law Court. The formal teaching rooms are predominately glazed making education ‘more visible’ and are supported by informal and social learning spaces, including external learning ‘rooms’, that provide break-out facilities encouraging interaction and cross faculty working. 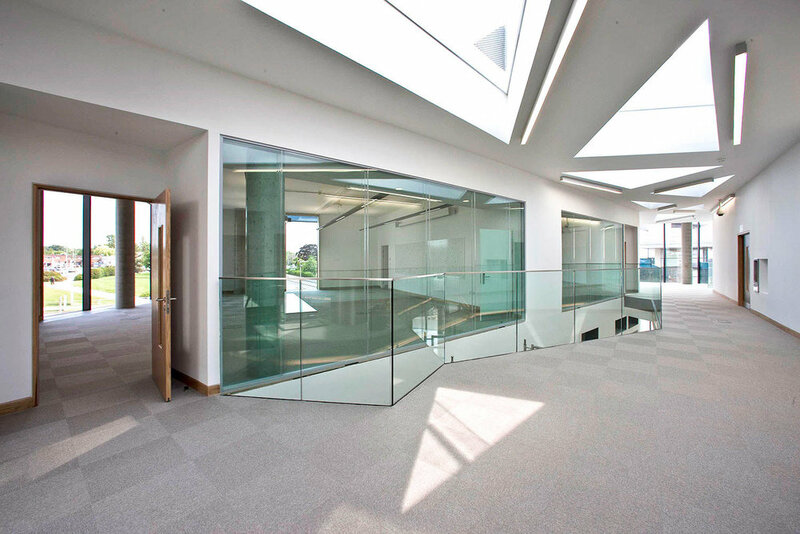 The building is BREEAM Excellent, delivers ‘A’ rated energy performance and innovatively integrates natural ventilation and daylighting into the formal courtroom. The project emerged from the University’s Masterplan 1999 which identified the site for future expansion. The project also incorporates the remodelling of the ground floor of the Academic Building, completed in 2003, to provide a professional and inspiring work environment for the Law School academics and professional support staff with associated shared meeting and social space. In addition to the provision of teaching facilities a new campus reception was designed as part of the reworking of the main arrival square and main entrance. The building has been ranked 8th among the top 50 Law School Buildings in the World.